The Philadelphia based Spacemusic duo The Ministry of Inside Things exist outside the confines of the recording studio and in the realm of the live performance. As MoIT, Art Cohen (guitar) and Chuck van Zyl (synths) continue a tradition of bringing an otherwise methodical studio based art form out into the spontaneity of the performance environment. 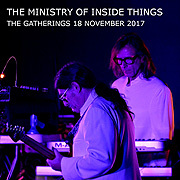 The Ministry of Inside Things are considered among the most innovative of US spacemusicians today. Equally influenced by the early groundbreaking music of Tangerine Dream, Klaus Schulze and Ash Ra Tempel as well as that of Pink Floyd and The Grateful Dead, their work has been described as linear, pushing forward across a diverse sonic terrain. 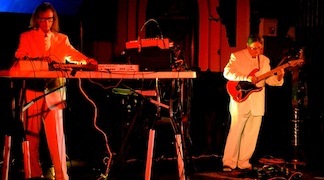 Based on live improvisation, The Ministry of Inside Things creates electronic realizations that flow from theme to theme, within the context of a composed suite of music. Through use of texture and atmosphere as well as harmony, rhythm and melody, this duo transports the listener on an internal aural excursion. Always bringing their own influences and innovation to the music process, MoIT produces a sound that is uniquely individual and personal. Proceeds from the sale of The Gatherings 18 November 2017 by The Ministry of Inside Things go to support the efforts of CIMA of PA, the IRS recognized, non-profit, all-volunteer organization which oversees The Gatherings Concert Series in Philadelphia.